I feel Iike my set up would benefit from a back bar. Would people recommend using the front bar mount or the rear stab mount? I feel like I’d want the weight further back and would use the rear mount. But I see a lot of people running the combo mounted to the front bar. Just looking for advice. Currently running an 8in carbon stack Out the front. Thanks! On my podium I noticed I was wanting to hold high so I started adding some weights and want to add more but it’s like a jigsaw puzzle trying to stack weights. I have 13oz on the back and 5oz on the front. I have the back with a 2" stud and a 1" stud so I will have enough to go all the way through. What do guys who add like 25oz on back and 12oz on front do? I have to order more weights as I am out and am going to continue to add but didn’t know if stacking the studs was the way to go. If so I will prob order more of the 4oz weights next time instead of a assortment like I did before. 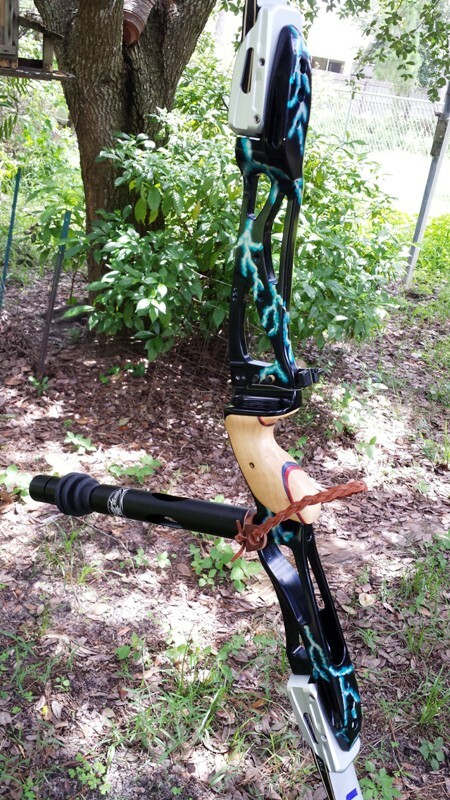 I’m new to bows and bow hunting and need input from the good folks on AT about what kind of stablizer I should get for my new to me maxxis 31. My first hunters setup is the 10-8 bee stingers sport hunters. I’m running them on an xcentric 7. Everyone says xpedition loves a lot of rear weight. I’ve adjusted several different ways. Now running 4oz total front and 16 total rear. At full draw my pin still starts dropping. I’m thinking this is because it’s adding total weight to the bow itself. The bow does want to slightly rock back. When I bring weight off the back and some off the front the pin still rolls down. Any tips guys. I’m wanting to shoot 3 and 5 spot tourneys. The bow naturally wants to rock to the right at draw. So I’m trying to level it by adjusting the back bar more to the left so I’m not fighting the bubble. Here is my first try at making a stab like this. I used 3/4" UHMW PE that I got on Ebay and some pipe caps I got from Menards. I build two stabs to test out my plans. To figure out the size of caps to use I cut a small piece of the UHMW and brought it to Menards. I just started testing out caps until I found ones that worked. I build one 10" long and the other 6" long. After cutting the UHMW I sanded down the end a little and threaded the pipe caps on. Then I ground/filed/sanded the caps round. Before painting the rods I drilled and tapped both end of each stab. Here are the stabs after I painted them. After painting them I dipped them in a zombie pattern to match my limbs. I used parts from a limb saver stab that I had as weights. I ended up stripping the stabs and repainting them. The hardest part of this project has been getting the paint to stick like I want it to. After repainting and and redipping the rods I painted the caps and clear coated them. Does anyone use a stab on their hunting recurve? Am in need of a short stab on my new 17" hunting riser. Every bow I have ever had (compound or recurve) , the top limb wants to come back toward me at the shot. I like to have enough weight +vibration control in a stab to have the bow sit vertical in my hand. Just curious if anyone uses a stab and what you like. Thanks , GREG BTW I have done searches but all I get are recomendations for long target stabs. 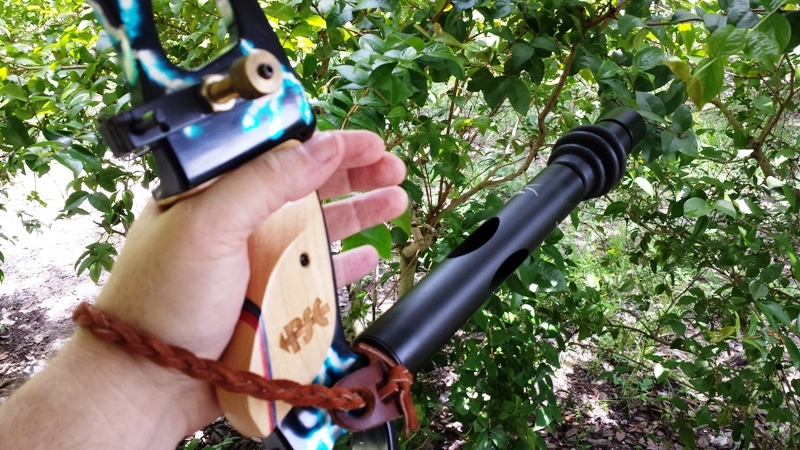 Posted in Latest archery newsComments Off on Does anyone use a stab on their hunting recurve? Well folks?…I woke up this morning…took one look at my new Octane Balance X Stab and?…shook my head realizing that while it was a little bit of everything I wanted in a stab for a very reasonable price?…today?…the word that came to mind looking at it?…was…"CHEESEY"…and really?..not enough of anything for my Mighty Zeus and wanted to kick myself for "Cheaping Out"…and it didn’t help matters that the many reviews I read before buying it?…were stellar…but then the reviews I read after buying it?…one site had 3 reviews on the octane balance X stab…with every one of them giving it (1) star and complaining that they fell to pieces on them in the first week of shooting. To make matters worse?…the two 1/2oz weights that came on the front were both way to light to counter-balance Zues properly and?…of a NON-STANDARD 1/4-20 thread design and screamed…small, light and chinsey…much like the damping unit and the twist lock rod…so today?…back it went…I was very pleased they were willing to give me store credit or?…just refund me my money…but I told’em…. "Naw…that’s okay…store credits just fine as I’m going to get what I should’ve got in the first place." 1 1/4" Diameter 12" long stab with all the trimmings…and all in a standard 5/16-24 threading…and for bonus points?…shouldn’t break in a weeks worth of shooting.